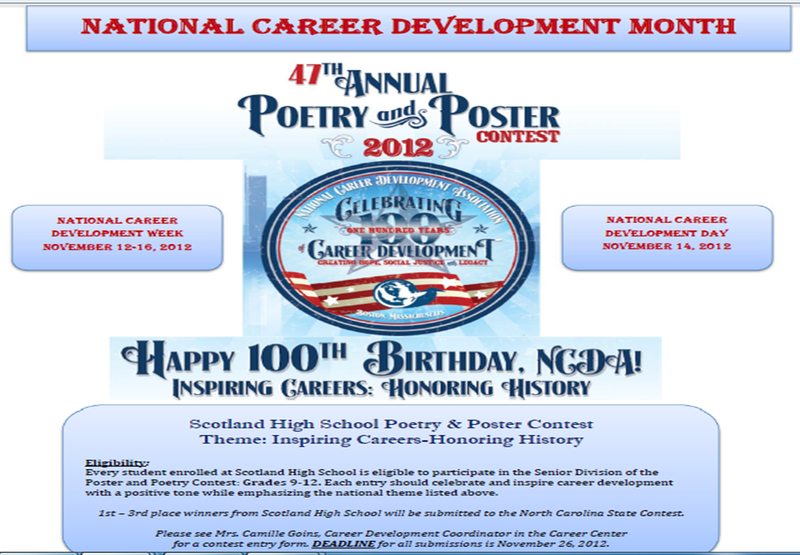 To celebrate National Career Development Month, NCDA hosts an annual Poetry & Poster Contest. Every adult and student enrolled in public, private, and parochial schools in states with participating NCDA state divisions are eligible. NCCDA is the proud sponsor of the State Career Development Poetry & Poster contest. During the month of November, schools from across the state will hold local, school and district contests to celebrate National Career Development Month. Local winning entries in poetry and artwork will be submitted to the State Contest. State winners will move on to the National Contest. Scotland High Poster: Click here for a printable flyer of the contest.